We all love the simplicity and convenience of kegging, but bottling for transportation is an annoying inconvenience. We either deal with complicated counter-pressure (CP) fillers or put up with the oxygenation and foaming of filling from a tap ... or we just give up on bottling altogether. 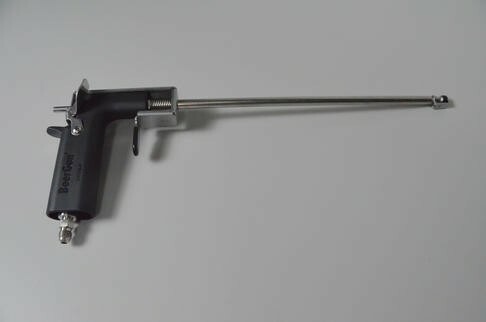 In true Blichmann Engineering fashion, the BeerGun® takes aim at all of those common problems and easily solves them with high-quality design, expert engineering and intuitive ease of use. Powered by Quiescent Flow Technology, this revolutionary bottle filler eliminates the complicated, time-consuming operation and cleaning of traditional CP bottle fillers used to fill bottles from kegs while maintaining their primary function – purging a bottle with CO2 (no oxygen pickup) and filling it with minimal foaming and carbonation loss. Couple that with the auto-fill level – and the ability to fill bottles of any depth without modification – and this filler is a clear standout. Quiescent Flow Technology℠ is so different and so easy to use that it’s another of our patented innovations! Our filler gradually reduces beer from keg pressure to atmospheric pressure with little turbulence, doing away with the complicated valving and cumbersome use of traditional CP filters. The result is a consistent bottle fill with little foaming and minimal oxygen pickup. In fact, we've acheived dissolved oxygen levels equal to that of $500,000 commercial fillers! Foaming is caused predominantly by turbulence and sudden changes in pressure. The unique patented design of the BeerGun® eliminates the need to pressurize the bottle by providing a non-throttling, quick-acting valve placed at the bottom of the filler stem and a beer-delivery system that is very low in turbulence. Competitors place their valve at the top of the filler, which forces the beer down an empty tube each time, kicking up foam along the way. Placing the valve at the bottom not only quickly immerses the valve in the beer but further reduces pressure change and turbulence, keeping the stem full of beer at all times. And because the beer is sealed in the filler stem when the BeerGun® is removed from the bottle, it automatically provides a consistent bottle fill level. These features, coupled with a CO2 jacketing tube for bottle purging and ergonomic valve actuators, makes filling bottles faster, intuitive, more accurate, and easier than ever! Because the BeerGun® doesn't require a pressurizing stopper, you can fill a bottle of any depth without buying different stem lengths or adding plastic hose extensions or maneuvering an awkwardly long filler. One-handed intuitive operation - so simple it's patented! Everything that touches the beer is stainless - no brass in the product period! My wife got me one for Father's Day. It's one of those luxury items I would probably never have bought myself, but am so glad to have. I keg most all of my beer, but occasionally want to take it to go in a few bottles. Before I used a growler filler tube and flow control faucets to fill bottles to go, and while it was effective it was a bit messy, then I built a counter pressure filler using a rubber stopper and a broken off racking cane attached to a picnic tap, which was a little better, but still a pain and occasionally had some blow back in my face. The beer gun has eliminated all of the pain of bottling. I can purge the bottle first so I don't have to worry about oxygenation if I want to store it for awhile, and fill them perfectly with little to no mess.